The SummerWorks Festival, to me, seems to be the home for unique and intriguing experimental theatre experiences. This is what drew me to The Smile Off Your Face. A half-hour fully immersive theatrical adventure meant for an audience of one that entices, coerces and even seduces all five of your senses in one memorable experience. The Smile Off Your Face runs throughout the festival at the Artscape Young Place with performances running every 15 minutes. Each audience member is asked to sign a waiver before entering. It is not for everyone. 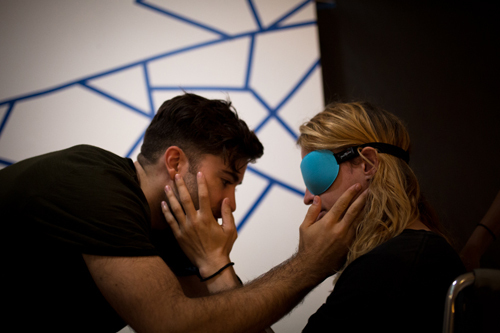 If you are sensitive to being blindfolded, experiencing unknown touch — the physical touch can be interpreted as ‘intimate’ but is not sexual in nature — have allergies or sensitivities to scents or foods, then The Smile Off Your Face may not be for you. After my waiver is signed, I’m escorted to sit in a wheel chair, as is each audience member. I’m blindfolded, hands gently tied together with a cord. I’m wheeled into a room, through a curtain, where mystery and adventure awaits. Humans have five physical senses — sight, smell, hearing, taste, and touch. For those capable of sight, we rely on it the most. This experience begins by first eliminating the sense of sight, thus allowing the others to become enhanced. Music — calming and meditative yet uplifting — wafts in and out of this space; the sounds of children giggling in the background. Voices cry out repeated phrases throughout. What sounds like the strike of a match, distinct scent of burning sulfur and heat near the face. Slight paranoia that I’m going to get burned. My wheelchair stops. I’m approached by someone — masculine I realize — as my hands are brought up to caress a face prickly with chin stubble. Hands caress my face. It’s gentle, warm and kind, loving. I’m held in an embrace and we sway to the music ever so slightly. Suddenly, I am roughly pushed against the wall. Wow. Hot… And I hear the sounds of a shutter going off? I think someone took my picture. Similar moments follow as I’m escorted back to my wheelchair. One involves being escorted to lie in a bed while a feminine someone with a calm and soothing voice lovingly strokes my arm while asking about my day and the experience of falling in love. At another point, a different feminine someone coos sensually into my ear, feeds me chocolate and gingerbread and then has me grasp and feel a peeled carrot in a rather awkward way. There’s no discerning narrative to this experience, more a collection of pieced together moments meant to stimulate both senses and emotions. I left the experience with a warm tingly sensation of whimsy and wonder, as hokey as that may sound. The Smile Off My Face walks delicately on that line of personal comfort and intimacy without teetering too far overboard. The Smile Off Your Face plays at Artscape Youngplace Studio 107 (180 Shaw St). Performances run throughout the day, see website for details. Audience Advisory: Audience Participation — the audience member is blindfolded, placed in a wheelchair, and has their hands tied. The audience member will experience physical touch and will be escorted to walk in brief intervals. Taste as a sense will also be explored and audience members are required to read and sign a waiver, as well as list any allergies or food sensitivities.